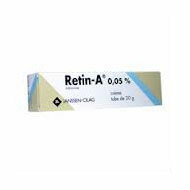 Retin-A (Tretinoin) is used to improve the appearance and texture of the skin. Tretinoin is a derivative of vitamin A. Topical Tretinoin is used in the treatment of mild to moderate acne and on skin that has been damaged by excessive exposure to the sun. Tretinoin irritates the skin and causes the cells of the skin to grow (divide) and die more rapidly, that is, it increases the turnover of cells. The number of layers of cells in the skin actually is reduced. In patients with acne, new cells replace the cells of existing pimples, and the rapid turnover of cells prevents new pimples from forming. By a similar mechanism, Tretinoin can reduce some wrinkles, areas of darkened skin, and rough areas of skin, all of which occur in sun-damaged skin. In patients with sun-damaged skin, improvements in the skin usually are seen within the first 3 to 4 weeks of treatment. Brown spots begin to fade after six to eight weeks. Wrinkles decrease or disappear after three to six months. Following application to the skin, a minimal amount of drug is absorbed into the body. The FDA approved topical Tretinoin in 1971.